Mark over at OC3D.net has reported that Intel’s Core-X series will not be using a soldered IHS. This is something that is pretty unexpected and has material consequences for the end user. To put things into perspective, most of Intel’s last generation mainstream offerings have been using a soldered IHS – which had both pros and cons (for different people). Before we get into the nitty gritty of things, a basic overview for those who are not aware about the issue is in order. The IHS or Integrated Heat Spreader is the metallic covering of the CPU package inside which the actual CPU die is located. In most cases, the die is connected to the heat spreader by solder. In other words, they solder the heat-spreader to the die. This is something that has a lot of benefits for the average user and a disadvantage for the rare enthusiast. Using solder as a Thermal Interface Material (TIM) means that you are getting perfect contact and conductivity is maximized. The thermal performance of the CPU (think temperature while overclocking) will be at its absolute best as compared to any other TIM, as long as you have a heat spreader in the equation. Here is the thing though, if you really want to push CPU thermal performance to the limit, you have to de-lid the CPU and mount the cooler directly on the die (eliminating the heat spreader from the equation) using a conventional TIM. This is something that is very hard to do if your CPU is soldered since you run the risk of damaging the die while doing so. So when we say Intel will not be using a soldered IHS in its Core-X series of processors, it has two primary implications: 1) the out-of-the-box thermal performance will probably be not be as good as a soldered IHS and 2) de-lidding will be significantly easier and less risky than previous generation Core processors. 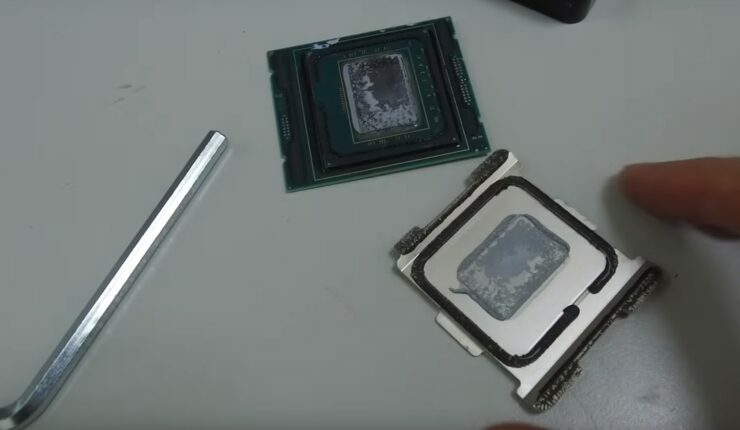 So the question then becomes, is Intel forcing overclockers to de-lid their shiny Core i9 to get the most out of it? Probably not. As with most other things, it comes down to cost and logistics. While using a TIM instead of a solder has both upsides and downsides, the fact remains that it is cheaper and easier for the company to achieve than soldering the IHS to the die. So how does this affect the consumers? well, lets break down the market segments into three categories: 1) Laymen, 2) Enthusiasts and 3) Serious Overlockers. The first and second categories are consumers who are worse-off as compared to a soldered IHS. This is because these people will either not mess with the multiplier at all, or use an aftermarket cooler and simply use that to overclock. They will not be interested in getting down and dirty and actually de-lidding the CPU (not to mention shying away from the hit in re-sale value that the product will take immediately in case of de-lidding). On the third side however, this is a move that will probably be good news for the serious overclocker. Since using a TIM means that the Core-X processor will be easier to delid this is something that is probably a good thing for the ultra-enthusiast community. It goes without saying however, that this portion of the end user will be in the minority. I am not sure of the exact nature of TIM used and whether any other solder is used to secure the package, but depending on how its done, it could even mean that you could re-lid the CPU once you are done with it. So basically, this is the first time that Intel has not soldered its premium HEDT lineup and will end up affecting the vast majority of consumers adversely (unless you decide to de-lid your CPU). This is something that will allow Intel to save time and money and it remains to be seen just how badly the TIM performs as as compared to an IHS based design. That said, the average consumer will probably not notice the difference assuming he has a good enough aftermarket cooler.